The White menu features Dimming, tunable Kelvin range from 2700K tungsten to 6500K daylight and Green/Magenta control channels. The Green/Magenta control can be scaled from 0- to 100, where 25 = ¼ correction, 50 = ½ correction and 100 = full correction. In the Gels/Hue menu, the Kelvin range is extended to 2500K Kelvin to 9900K daylight and a fourth channel is called Gel. The Gel channel includes Kino Flo presets such as blue & green screen, sodium vapor, mercury vapor as well as over 100 well-known lighting gels. The gel function can be applied to any Kelvin temperature and by pushing the control knob in/out, the gel will be applied or removed. A fifth channel called Hue Angle (Hue) and sixth channel Saturation (Sat) are also included in the gel menu. These two channels behave similar to a traditional color wheel, where white light is in the center and Hue Angle determines the color along a 360-degree range and Saturation determines how much color is applied. With the Hue Angle and Saturation it is possible to create over 2 million color combinations! The RGB color menu gives individual control of red, green and blue LED’s. The RGB mode is a great way to work with apps with predetermined RGB presets or color wheels. RGB menu is also a great feature to dial in specific gel RGB values or when controlling colors from a DMX desk. The FX (Effects) menu introduced on June 1, 2018 provides access to popular effects such as Candle, Fire, TV, Police, Lightning, Paparazzi, Pulse and Scroll. When on the desired effect, there are several pre-sets as well as control parameters that can be altered. For example, in the Lightning effect there is a “Storm” and “Frankenstein” preset, but it is possible to change Rate to provide additional variation. For FreeStyle LED DMX Mapping, click here. 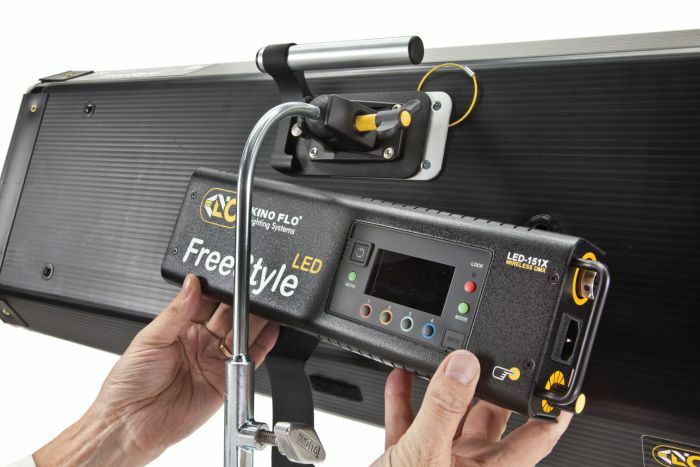 The firmware listed above is loaded onto the FreeStyle LED controller and can operate the Freestyle 31 fixture remotely with a 25ft extension cable or can drive the panel directly when mounted to the back of the fixture. The Freestyle controller (LED-152X), includes standard DMX in/out ports for cable as well as wireless DMX connectivity (Lumen Radio®). The controller features universal AC voltage input 100-240vac (0.65 Amps at 230vac) as well as a 3-Pin XLR for 24vdc operation (6.25A).